A person with extended and multiple knowledge: As a professor, Hugo is an author of many books about science, history, and classic languages; and so, he has been recognized as a polyhisor and scholar in many fields of learning. © ALL rights are reserved. 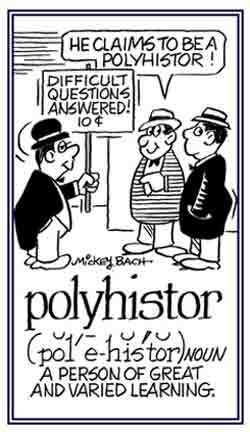 Pertaining to or referring to a polyhistor or a person of great and varied learning. In Greek mythology, the Muse of sacred songs or hymns, one of the nine Muses believed to inspire and nurture the arts. A complex group of deductions resembling a predicament that has many possibilities. A description of of any disease or condition marked by numerous remissions and exacerbations (increase the severities of or making worse). A mania affecting several mental faculties; the opposite of monomania. In humans, a condition in which more than two breasts are present. In humans, a reference to having more than two mammary glands or breasts. 1. Much or varied learning. 2. Acquaintance with many branches of knowledge. The German Jesuit polymath, Athanasius Kircher (1602-1680) was acclaimed during his life time as one of the most learned men of his era. He made contributions to almost every branch of science including mathematics, astronomy, harmonics, acoustics, chemistry, microscopy, medicine, was believed to be able to decipher Egyptian hieroglyphics, and published extensively on scientific topics. Showing page 10 out of 21 pages of 305 main-word entries or main-word-entry groups.